Guitar-Antics Blog » Opposites Attract ? 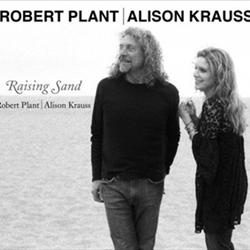 While we’re all waiting for the new Led Zep album “Mothersip” to come out, we can enjoy now a new album just out by Robert Plant and Alison Krauss. The Plant and Krauss album ‘Raising Sand’ is expected to be a Top 5 debut in the USA next week. It may even come in at number two. The Plant and Krauss album was produced by T-Bone Burnett (‘O Brother, Where Are Thou’ and ‘Walk The Line’). ‘Raising Sand’ is a collection of covers of songs from artists like The Everly Brothers, Tom Waits, and Mel Tillis. Plant’s previous diversion this far from Led Zeppelin was when he recorded the classic ‘Sea of Love’ for The Honeydrippers EP in the 80s.